In a June 15 letter to Mr. Brooks, Mr. Walsh pointed-out that this denial is a violation of the Pennsylvania Sunshine Act. Mr. Walsh asked Mr. Brooks to reconsider this action. 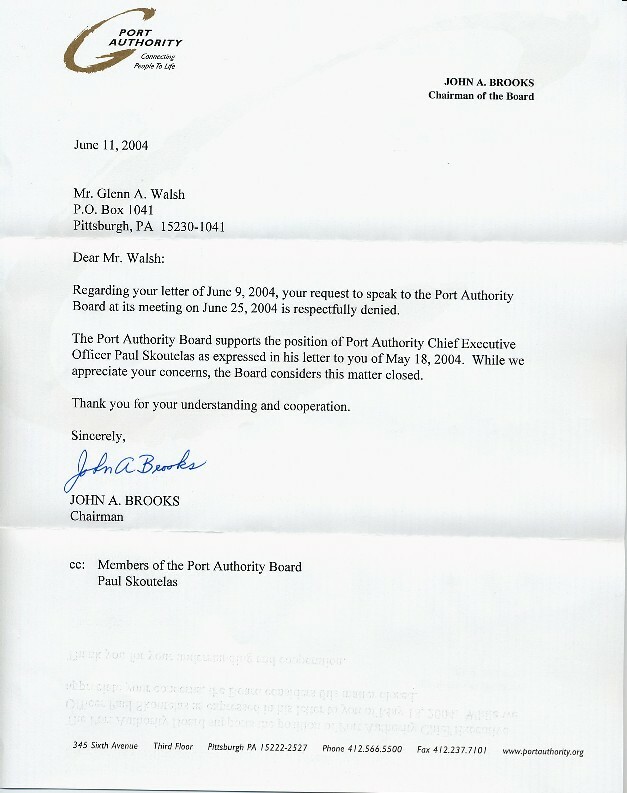 The reason Mr. Walsh wished to address the PAT Board on June 25, was to reply to a letter Mr. Walsh received from PAT Chief Executive Officer Paul Skoutelas, which was a response to Mr. Walsh’s address before the PAT Board on April 23. In the April 23 statement, Mr. Walsh alerted the PAT Board that $2 million of taxpayers’ money would be completely wasted if PAT’s plans to abandon a never-used rail storage yard at Penn Station, part of the proposed “North Shore Connector” rail expansion project, is implemented.